This was another dish from the cooking class I had a small port tenderloin leftover that I was going to grind for pork burgers but decided this would make a great meal for two Fantastic, flavorful dishes that just happen to be gluten free. I also have some chicken thighs and I’m a sucker for 5 spice and chicken so those were thrown in the marinade also. Beware I pan seared the chicken first but all the ingredients took to shall we say really caramelized – which was good in a way, I ripped off the skin after and did not eat – but I love the crispy crunchy chicken skin I mourned for a tiny time. Mix together all the marinade ingredients in a glass bowl or my favorite plastic bag. Add the pork and turn to cover evenly. Cover and refrigerate overnight. Drain the tenderloins, discard the marinade. Heat oil in fry pan and sear on all sides. 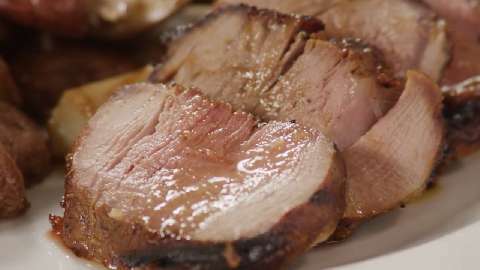 Transfer pork to an oven proof dish and roast until cook to your liking about 15 minutes. Note: I skipped this part and finished on the BBQ. Remove the pork tent loosely and let stand for at least 10 minutes before serving. If you did in oven, deglaze pan with white wine add stock and simmer gently until reduces, If you prefer, thicken the sauce with the cornstarch, Adjust seasoning with a little orange juice, soy sauce or maple syrup. Unwrap the pork tenderloins add juices to sauce than carve into slices, Server with sweet potatoes and pumpkin mash and stir fried Asian veggie. Did you realize that sweet potatoes and Yams are never in season at the same time? This entry was posted in Meat, Pork and tagged pork tenderloin. Bookmark the permalink.